The definition of part-time practice refers to the term PROFESSIONAL TIME. What kinds of activities are included in the term PROFESSIONAL TIME? time spent traveling in your capacity as a LAWYER (e.g. travel time to court, but not travel time going to and from work at the beginning and end of a day). social time spent with clients. Due to a major file that I am involved with, my gross billings for the year may exceed the maximum billings allowed under the part-time practice criteria. I’ve qualified as a part-time practitioner in each of the last two years, and expect that I will again qualify for part-time practice this year. What happens if my billings go over the maximum billing criteria because of this one file? 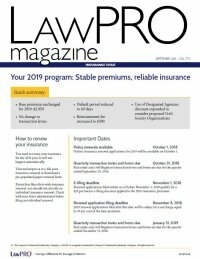 If, at any point during the year you cease to qualify for the part-time practice criteria, you must promptly notify LAWPRO of such in writing, and you must pay the full-time practice status insurance premium. Your premium will be adjusted retroactive to that year’s POLICY inception date. As well, you will not be considered to have been in part-time practice for the current fiscal year, and will not qualify for the part-time practice premium discount for the next POLICY year. In anticipation of retiring from the practice of law in the next couple of years, I have worked a limited number of hours this year and my billings have been low. Am I eligible for the part-time practice option? The answer depends on whether or not you meet the Part-Time Practice criteria with regard to billings and hours.